Sonnhalde Guest House is a traditionally built detached property set over three levels. The main entrance is from the front which in turn leads into a well presented reception hallway. The hallway is tastefully decorated and gives access to all areas private and public. The Property is split into two distinct parts, with both the guest house and owner’s house benefiting from their own entrances. Internally there is a lockable door giving owner access to the letting accommodations. This in turn gives potential to extend the letting accommodations. The entrance vestibule is accessed via double doors, has a tiled floor and a door giving access to the entrance hall. The entrance hall has stairs rising to the first floor landing, a storage cupboard, a door through to the kitchen and further doors that give access to the lounge, dining room and bedroom one. 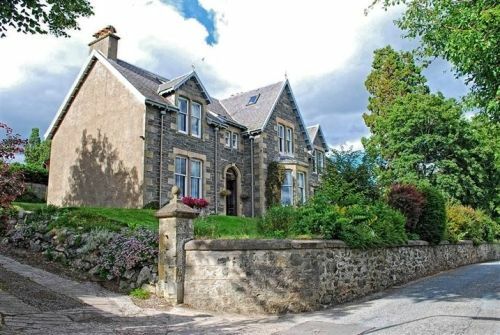 The sitting room is accessed via the entrance hall, has a bay window to front elevation with views overlooking the gardens, village of Kingussie towards the mountains and beyond. There is a feature Victorian tiled fire place with wooden surround, a shelved cupboard and a radiator. The dining room is accessed via the hallway, has a feature open fire place set in a pitch pine surround and a window to front elevation with views over the garden, village of Kingussie towards the mountains and beyond. Kingussie is a small town in the Highland region of Scotland. It lies beside the A9 road, Kingussie is 42 miles south of Inverness, 12 miles south of Aviemore, and 3 miles north of Newtonmore. The front garden is mainly laid to lawn with flowerbed borders and has stone walling to the front elevation with a driveway that leads to the side and rear garden. The driveway has been laid to gravel providing ample space for off road parking. The rear garden also has an area laid to lawn and there is access to an outbuilding which could be converted into a garage or a one bedroom holiday home. Accounts are available on request after a formal viewing has taken place. The sale of the Sonnhalde Guest House offers a rare opportunity to purchase a high quality, beautifully presented Highland property which is trading well but with potential for expansion of the business. The business trades with the benefit of a full Guest House Licence, and conforms to all fire regulations. O/O £450,000 are sought for the heritable property, fixtures, fittings and goodwill. Stock in trade will be additional at valuation. All offers, couched in Scottish Legal Terms, should be submitted to the seller’s sole agents Bruce & Company. Visit our website at for a range of other properties available. Bruce & Co is the trade name of Bruce & Co Ltd. Registered in Scotland No: 190660. An inventory will be compiled to detail all items of a personal nature excluded from the sale and items subject to lease; this will be available to all parties wishing to offer. Property descriptions and related information displayed on this page, with the exclusion of Running Costs data, are marketing materials provided by Bruce & Company, and do not constitute property particulars. Please contact Bruce & Company for full details and further information. The Running Costs data displayed on this page are provided by PrimeLocation to give an indication of potential running costs based on various data sources. PrimeLocation does not warrant or accept any responsibility for the accuracy or completeness of the property descriptions, related information or Running Costs data provided here.